Many bike owners steer away from carrying out any type of mechanical work on their machine. If all you are interested in is the ride, that is fine; as long as you have your bike checked and serviced by a reputable mechanic, on a regular basis. However, it’s simple to keep a check on your bike’s brake pads and doing so means that you remain safe on the road. Using a professional motorbike sales site to purchase your machine from helps to ensure that it’s in good condition when you first ride it. However, it still makes sense to check the bike over. This includes checking the condition of the brake pads. Why is checking your bike’s brake pads so important? You may think that you would be able to tell if there was a problem with the brake pads just by riding a bike. This is not necessarily the case because a worn brake pad can initially provide more affective braking than a brand new one. The material at the front of the brake pad wears away and the metal at the back makes good contact with the brake disc. This situation does not last long however as the metal eventually overheats which means that you could have seemingly good braking power followed closely be complete brake failure. What to look for when checking brake pads? Checking the brake pads on your motorcycle takes just a few minutes. There are certain things you should look out for. There is more than ¼ of an inch of pad left. If there is less than ¼ of an inch left the pad should be replaced. There is no uneven wear. If the wear is not even, check the slider pins to see if they are bent or damaged. There is no oil on the pads. If there is oil present, you should check where the oil is leaking from and deal with that issue before replacing the pads. The friction material on the pads is shiny in parts. This can be caused by excessive levels of heat and has an adverse effect on braking performance. Any of these issues can mean that braking is not as effective as it should be and that you are in danger when you ride. It’s possible for you to change the brake pads on your bike yourself. However, you need to be careful when you are doing so as brake dust should never be inhaled. Use brake cleaning fluid to keep the area clean as you work, wear protective gloves and make sure that you do not inhale anything. If you feel safer, wear a mask over your mouth and nose while you are doing the work. 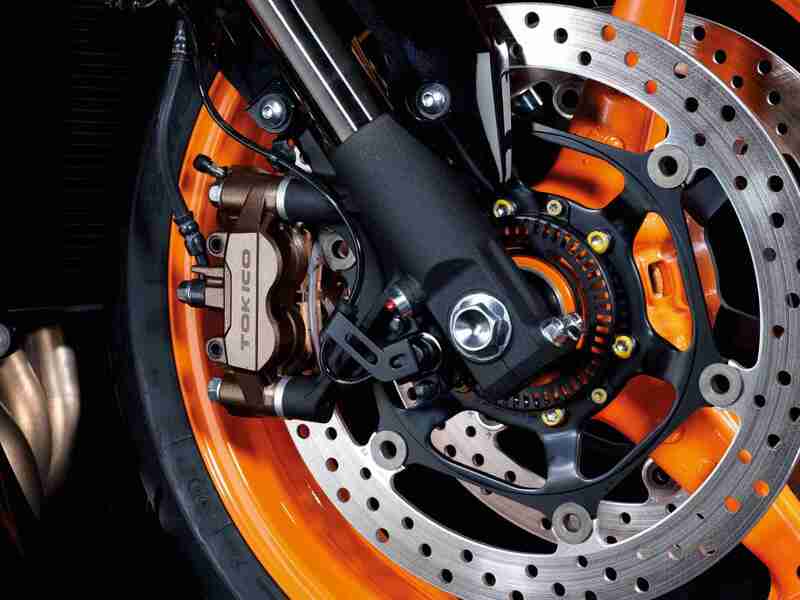 Keeping regular checks on the brake pads of your motorcycle helps to keep you safe while you are on the road. If you think that the pads need to be replaced, never delay in doing so. If you do not feel confident enough to do the work yourself, ask a professional mechanic for help.